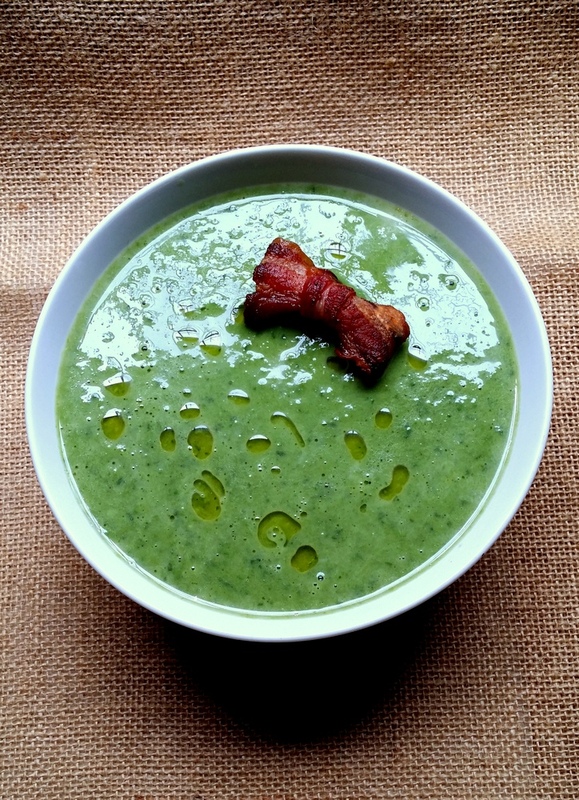 Sequinned with olive oil, swirled with cream and flourished with a bacon bow, this fresh-flavoured soup is quick to make and tastes as lovely as a spring morning. 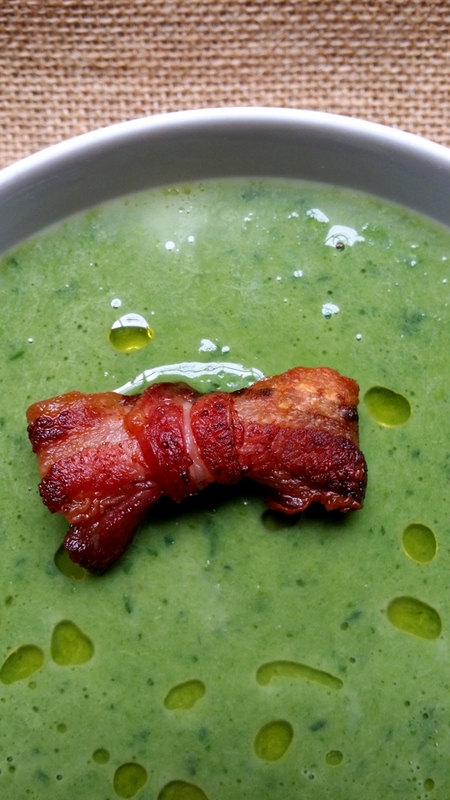 The bacon bow is twee, I admit, but I added it to my soup as a personal reminder a) to have fun with food and b) that a bit o' bacon is SO allowed on my new diabetic regime. What I love about this soup is that a fast cooking time allows its individual flavours - leeks, peas, baby spinach leaves and curly parsley - to sing in clean voices. I hesitated to use frozen peas as a thickener for this soup, believing them to be rather starchy (and thus verboten along with potatoes and cornflour), but was pleased to discover that they are not to be feared, having an average glycaemic index value of 48. All three of the South African frozen-pea brands I checked contain fewer than 6g of carbohydrate per 100 g, which is a piffling amount in the broader scheme of things. However, as I'm not (yet) an expert on these matters, I advise you to read the nutrition labels on your pack of frozen peas if you're on a low-carb or diabetic diet. A dribble of fruity olive oil brings all the flavours to life. In this recipe I've asked you to use proper chicken or veggie stock, but if you don't have a home-made stash in your freezer, you can feel no shame in using a good-quality jellied stockpot or fond (see my Cook's Notes at the end of the recipe). Heat the oil in a large pot and fry the sliced leeks over a medium heat for 5 minutes, or until they are translucent. Don't allow them to brown or catch. Stir in the garlic, fry gently for one more minute, then pour in the stock. Turn up the heat and bring to a rolling boil. Add the frozen peas, all in one go. Stir to break up any frozen lumps, and cover the pot with a lid. Turn down the heat and cook at a gentle burble for five minutes, or until all ice crystals have disappeared. Now add the baby spinach leaves and chopped parsley to the pot, pressing them down with a spoon so they're submerged in liquid. Simmer, uncovered, for a further 5-7 minutes, or until the spinach and parsley are tender, but still a lively bright green. Whip the pot off the stove and blitz it to a fairly fine purée, using a stick blender or liquidiser. Return the soup to the heat, stir in the lemon juice and season to taste with salt and pepper. Now stir in the cream. Serve hot, with bacon bows or crisp-fried crumbled bacon. For the bacon bows: heat the oven to 200 ºC. Trim the bacon rashers so each one is perfectly straight and neat. Cut off one quarter, crossways, of each rasher, and set aside: these will be the centres of the bows. Place the long strips of bacon on a baking sheet and fold them into bowtie-shapes by bringing their short edges together on the underside. Wrap the reserved short pieces around their middles to form neat bowties, and press out the bow ends using your fingertips. Place in the oven and bake for 10-15 minutes, or until crisp. Drain on kitchen paper and keep warm. Serves 8 as a starter or snack; 6 as a main course. An excellent chicken stock will add fine depth of flavour to this soup. If you're in a hurry, you can use good boxed chicken stock, or boiling water plus a few teaspoonsful of a Nomu fond or a jellied Knorr Stock Pot. If you can't find baby spinach leaves, you can use well-rinsed, finely chopped fresh chard instead. Flat-leaf parsley will do for this dish, but I find that old-fashioned curly parsley has a distinctive perky flavour quite lacking in modern parsley hybrids. Love it Jane, you are going to help so many people! Love your bacon bow ties - they really make up in lusciousness for the lack of bread to eat with your soup. Thank you Nina! I certainly hope so. And thank you too Kit! They are a bit prissy, but I don't much care about that. Gotta love bacon. I loved this soup! So did my 5 year old, which says a lot if your 5 year old asks for it for breakfast the next morning! :) She was convinced I picked a whole lot of grass from the lawn and whizzed it up in a soup and that we would turn into cows if she would eat it. Got to love their original minds. Thank you for this! As a long-time follower who has recently started doing Keto I'm amused to see that one of the food bloggers I already followed started the same! This soup looks SO good, I happen to have some chard in my fridge and some chicken stock in my freezer so I'll get what else I need and make it today! You are so inspiring! 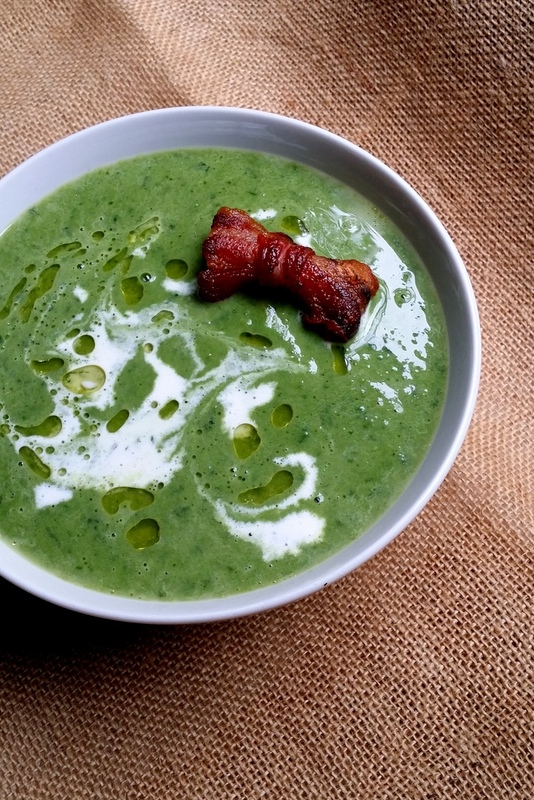 Not only does this soup sound delicious, but the bacon bows are adorable! Such a great idea. It looks so good! But dont think the taste can be delicious! ?